Donguibogam Village, Sancheong-gun, Thursday 12 September, 12 noon. After a refreshing herbal tea, it was time for lunch: Sancheong Beef bulgogi with Mr Byeon, Min Hyang-sik and Min Young-ki. Not only barbecued beef, but in increasing order of difficulty, raw beef fillet, raw beef liver, and raw beef lung. I really struggled with the last one. But the soju helps to wash things down if anything sticks in the throat. It was my farewell to Min Young-ki and Mr Byeon, but Min Hyang-sik and Kyung-sook come with me to the Institute where we carefully go through all my painstaking corrections to the brochure with Director Kim, and discuss the upcoming presentation to the World Health Organisation. Kyung-sook is now getting more nervous, as she is informed that the talk will be delivered solely in English. By her. And when I returned to London I would get regular calls from her asking how to pronounce various botanical terms, up until the time when the conference was over. I leave the Institute, loaded down with gifts, including two large boxes of dried doenjang, with enough for 36 two-person portions of doenjang jjigae. The product is made by one of those small businesses which are indirectly supported by the Institute. In fact, the company may even be an example of an Enterpriser Cooperative. When I got the product home, I experimented with making the soup. I added tofu, courgette, chilli and onions along with hot water, and simmered for a while. That first batch had to be discarded. There was quite enough chilli in the product already, and my addition of fresh chilli made the stew unbearably spicy. The next batch worked very well though. 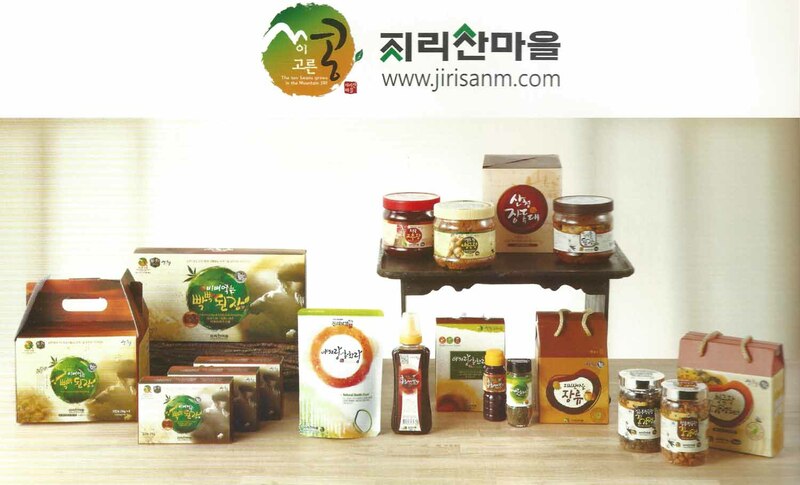 So if you see 비벼먹는 빡빡된장 from 지리산마을, give it a try. It’s as easy as making pot noodle. There’s a small amount of time to see some more of the Expo. We go to the Donguibogam Museum and pay another visit to the International pavilion. In the Donguibogam Museum the main attraction is a special exhibition to celebrate 400 years of the seminal medical publication. Published in 1613, Donguibogam is unique in its organisation of its ideas by specific organs rather than by disease, and its basic philosophy is to treat both mind and body. It facilitated the publication of many scholarly books to further medical development, and its prescription of readily available herbs was a great help for everyone, not just the wealthy. Its publication using Hangeul script enabled the uneducated to learn and practice medicine themselves in daily life. On display was of course an original copy of the Donguibogam itself, as well as a volume of its English translation. And as you find in many Korean historical museums, there are life-size models which tell some of the story. We stroll up the hill, through the herb garden, to take a final look at the International pavilion where so many different countries are exhibiting their own style of traditional medicine. Apart from the national stalls there is a feature on health in Korea, including statistics on causes of death. It is a sad fact that stomach cancer is a major killer, with Koreans having the highest incidence of the disease in the world. So the story goes, even Yoo Ui-tae, Heo Jun’s teacher, had terminal stomach cancer. Realising the end was near, in the first recorded instance of donating your body to science, he committed suicide, instructing Heo Jun to dissect his body to find out whatever he could learn in order to prevent diseases. At the time, invasive autopsies unheard of, with medical examination being confined to a visual inspection of the exterior of the body. 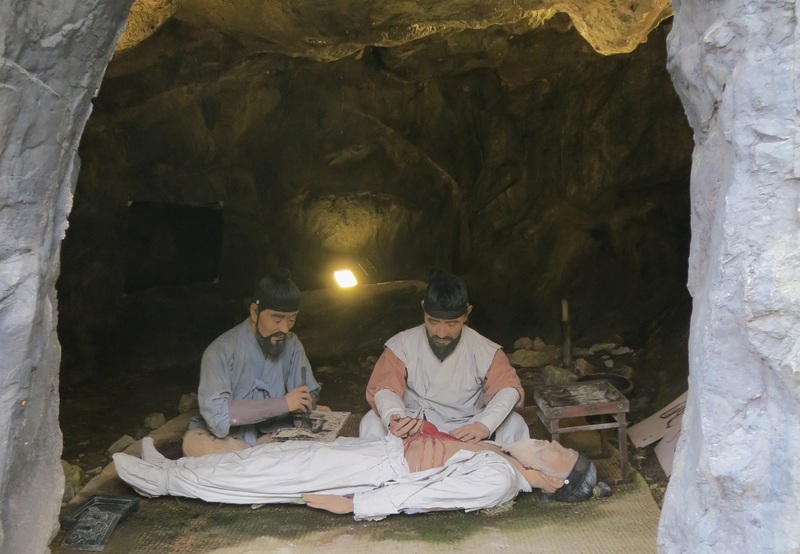 The incident is commemorated in the somewhat gruesomely named “Cave of Dissection” on the hillside below the Gi Experience Village, where life-size models re-enact that first autopsy. And then it’s time for a farewell dinner with Sena, Sena’s mother, Min Hyang-sik Kyung-sook and others. A herbal shabeu shabeu with pajeon and a deliciously delicate herb tempura. And, knowing that I liked sancho, they order soju flavoured with the fragrant and pungent herb. I should have been prepared for what came next, because it’s happened before. But as it was my last meal with Sena’s mother, she came equipped with a tote bag. Inside was a special gift for me: a zelkova wooden lacquer bowl made by Kim Eul-saeng, holder of intangible cultural property number 13 – Otchiljang (lacquer). He lives not far away in Namwon, Jeollabuk-do. Moving on from the restaurant we go next to find some patbingsu before we head our separate ways to bed.